Open Door Escape Games is a family friendly game created by a husband and wife team. Their idea in opening this company was to be a light to downtown Redlands and to support world and local missions. Matt is an assisting pastor at Wildwood Calvary Chapel and Angela is a Sr. Sales Director with Mary Kay. 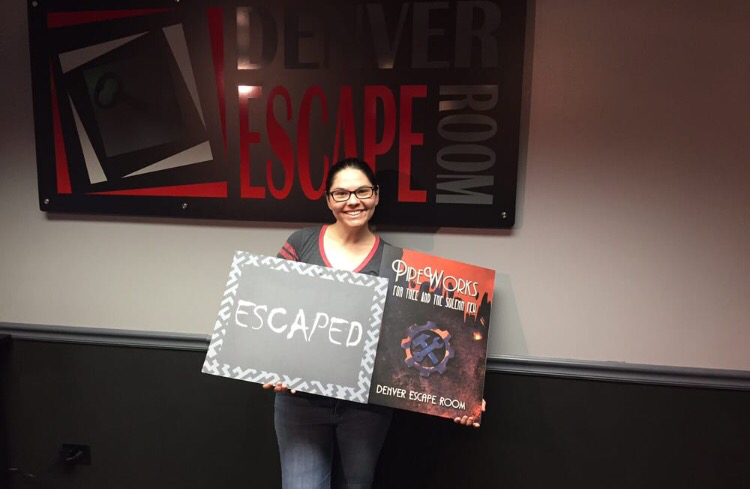 In my opinion they have successfully created a fun escape room that you could bring any of your family members or friends to play and enjoy. However, I do want to be clear that this room is not a “kids” room, the minimum suggested age is 13 because of the complexity of the puzzles. The Study is a first generation game with a solid story and clever low tech puzzles. I liked that since they don’t really lock you in the room, the justification for the “escape” is done seamlessly through the story. The Study has a super creative hint system that made me smile. The puzzles are complex and great for groups. The decor is nice. It feels like you are in a lived in study, which is spot on for the theme and story. Overall it’s an enjoyable game. Restaurant Suggestion: We ate at Crepes of Wrath and it was amazing! They offer wonderful gluten-free crepes and are great about other food allergies as well. Also very nice staff. We walked past it on our way to the room from the parking structure. I may have been Bess in a former life because I am absolutely in love with Houdini. Therefore, every time I’m in a city with a Houdini themed room I must play it. This however, was not my favorite Houdini room. Actually it could’ve been called, “Any old magician’s office,” since I didn’t really feel as though Houdini inspired anything in it. I know we were looking for shackles and a straightjacket, but Houdini was so much more than those two props. The room itself was spacious and well decorated. The study looked like a real study and so forth. The set pieces were nicer than the typical Ikea furnished room. The lighting and color scheme was pleasant. However, I didn’t really feel immersed in a Houdini-esque world. It felt like a really nice study that probably belonged to a magician. The puzzle design was average. There was little to no technology, which is fine, but the puzzle creativity was a little lacking especially when considering the theme. There was one really fun “Aha” moment, but other than that it all felt a little overwhelming and chaotic. There was a little searching involved. There was a lot of solving simple yet tedious puzzles both physical and mentally. There were two puzzles that stood out as far as being difficult for the sake of having something difficult in the room, one of which required prior knowledge. (Maybe playing chess is common knowledge, but I don’t think it is.) My biggest problem with the room was that amount of people they stuffed in it. It was way too crowded and even with the busy work there wasn’t enough to occupy everyone simultaneously. If you want a truly unique competition game, this is the escape room for you. Pipeworks is the most unique way I’ve seen an escape game designed to allow for competitive teams. Each team of engineers begins in one of two nearly identical rooms. There are color coded game pieces throughout these rooms and the engineers may only interact with the games pieces that correspond to their team’s color. The first major goal is to get the door between the rooms open so that engineers may move freely between both rooms and collect the game pieces they need. Depending on the teams you may end up working together even though you are competing against each other. I was competing against a team of 3 and at one point started working with them so I could get something I needed from them. (Sorry to be so vague, but I do my best to avoid spoilers in my reviews.) The puzzles were fun and a little tricky. I liked the way they designed so many great set pieces that were integral to puzzle solving but made the game visually stimulating. It was almost overwhelming at first to walk into a room with so many pipes. It’s very well done. It is perfect for large groups that want to compete against each other or just work together. I enjoyed competing against strangers when I played. I had the option of working with them and chose competition mode because I’m a pretty competitive person. Assassination Express, or as my husband likes to call it The FDR Room, was infinitely more fun than I expected. I’m usually a whimsical magic or dark horror fan and anything too historical or educational tends to leave me a bit bored, however this was exciting. We were first impressed by the professional lobby and the amount of space. Then the concept of the Time Displacement Institute made me a bit giddy. I think it’s wonderful that the company has an ongoing theme that allows for each game to still be drastically different yet tied together. Then the intro video experience set up a fun adventure. The game itself was beautiful done. It looked like a train car complete with windows showing the landscape passing by. It was impressive to say the least. The props that were strictly decorative seemed to be secured to the set for the most part. They did a wonderful job of presenting the 1930’s. There was a good amount of puzzles, mostly traditional locks with some surprises. It seems like a good challenge for beginning and intermediate players. We completed our mission to stop the bomb and saved history, but most importantly we had fun doing it. 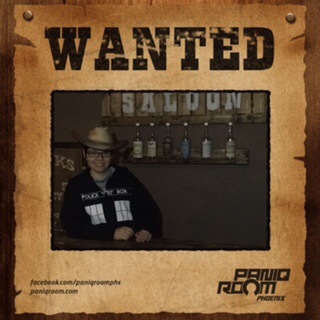 I had a rootin’ tootin’ grand ole time in this fully immersive Wild West escape game. I felt like a real old fashioned cowgirl trying to break out of jail with the physical puzzles that required me to use not only my brain power but other skills as well. One of the most impressive things was the set decor. You could easily forget that you were in a building in the year 2016 because of the impressive set design. The props were made to stand up to the roughest of cowboys. The puzzles were a good mix of physical and mental challenges. It isn’t the most difficult room and the gamemaster is willing to give assistance, so it’s great for beginners. I had a lot of fun playing it as an experienced player, but if you have a large team of experienced players I might suggest playing a more difficult game at this location. The staff here was outstanding, which made the whole experience even better. I actually came back later that day with a friend to play Kidnapped based on how much fun I had in Wild West by myself earlier that day.